Time for another challenge at The Card Concept! Typically we would need to always have an umbrella on hand this time of year, but Tuesday morning I woke up to 2" of snow--Yikes! We had some days last week that we didn't even need a jacket and today it is so cold. Bye bye winter time for you to go. A get well card inspired by both the inspiration photo and the striped paper pieced umbrella from Sarah Gray's post entered at CASology last week. After colouring the umbrella several times I wasn't getting the look I wanted. As soon as I saw her bright and cheery umbrella I knew that was what it needed. I used Weather Through from Fresh Squeezed Stamps and Blooming Marvelous from Clearly Besotted Stamps. Then I used Summer Sunrise cardstock from Papertrey Ink and Seen and Noted patterned paper from Pebbles for my design. Pop on over and see what the rest of the team has for your inspiration! Loveeeeeeee this! LOVING that umbrella!!!!!! 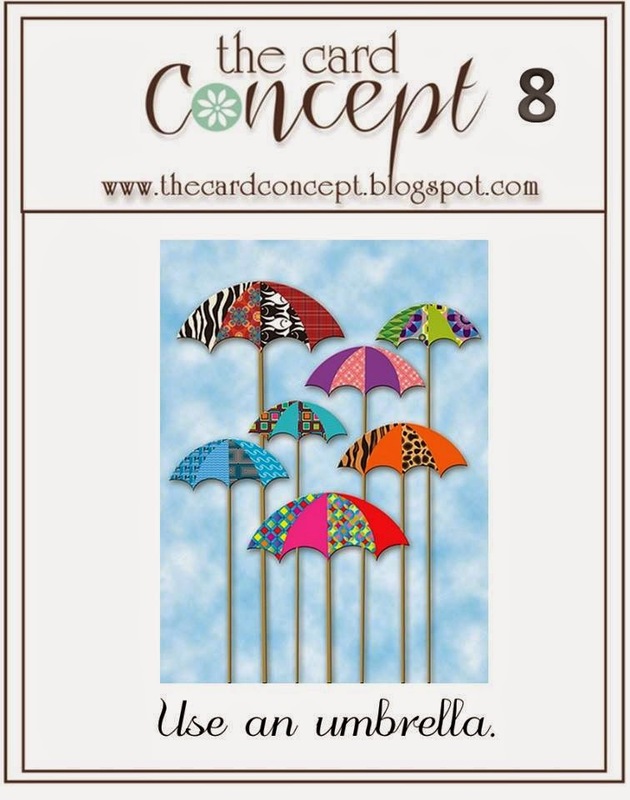 what a cute umbrella.. love the pattern paper.. great card..
Love that you captured all the fun of the inspiration, but kept it so CAS! And here in Washington I was hoping for some snow (in the winter months). I know you have had more than your share. Lovely CAS card. So cute. Eeek! I may just have to play along! LOVE your striped umbrella! I LOVE your super sweet striped umbrella, Tracey! Love your striped umbrella Tracey! Cute little paper pieced umbrella! CA...ute umbrella Tracey, sweet card! 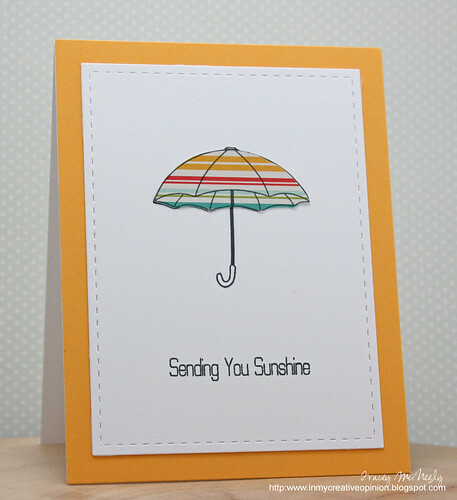 Those stripes are PERFECT for that umbrella and I love the bright yellow cardstock! A totally sunshiny card! This is such a pretty card, Tracey! 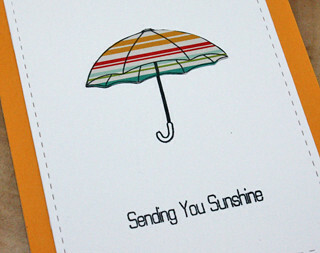 I love your striped umbrella and sentiment with your lovely CAS design! Love the stitched mat, too! Such a sweet umbrella...I want one just like it! I love the stripes and you did a perfect job of paper piecing too. Just too cute. You are the queen of CAS. This is great! Your paper pieced umbrella is perfect! Love the stripes!! Perfection!!! I love the striped umbrella. Flawless CAS design! Super cute! Love the striped paper and the yellow base. This card is AWESOME in its simplicity!! Love it! Gorgeous, the yellow card base really sets your umbrella off well!